A visual on how the new droid sidekick works in Star Wars: The Force Awakens! The new droid that accompanies Daisy Ridley and John Boyega’s characters on their journey through Star Wars: The Force Awakens is pretty much a ball with a small Artoo-Detoo style head. Inside the body there is a weight on a pole. The weight is heavier than the head which is constructed out of a light material allowing the head to always remain upright as the body rolls on the ground. I separated the sphere, as the concepts did, to show you how the mechanisms work. The droid does not do that in the film. Although, lots of gadgets that can be stored inside this droid and it has many mechanisms and defenses. 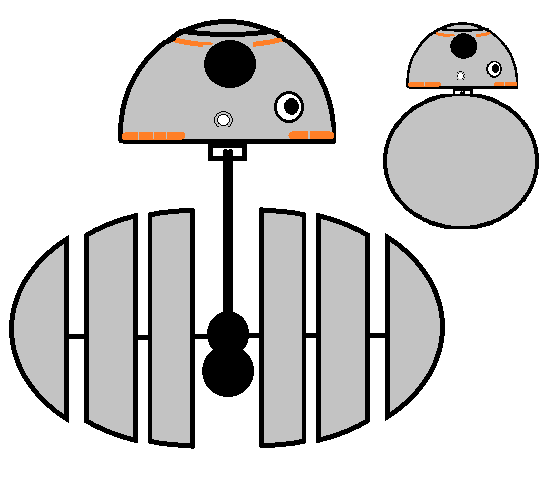 To allow the droid to operate functionally on screen as a puppet, the ball is allowed to role on two tracks that are either obscured or digitally removed. Check out the previous articles on this new droid for further info.